The most important step in returning your hair to its original state is the application of the highly effective natural herbal extract. The Hair and Scalp Extract is designed to maximize the natural growth-cycle of your hair. For best results we recommend that you apply the extract twice daily, a second application can be made any time after 30 minutes. The extracts must be used in conjunction with the NewHair Biofactors Shampoo, the extracts are not a stand alone product. When you have achieved the desired results (typically 18-24 months) you can discontinue the use of the Extract and maintain your healthy hair using only the Nisim Shampoo. This is not a product you have to use for the rest of your life. 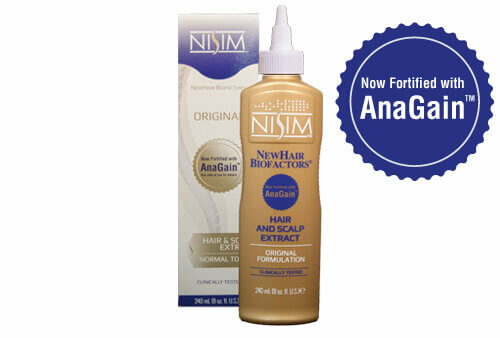 Nisimâ€™s Original Formula Hair and Scalp Extract now includes AnaGainâ„¢. AnaGainâ„¢ is based on organic pea sprouts designed to stimulate specific signal molecules in the dermal papilla required to reactivate hair growth. Thanks to its composition, AnaGainâ„¢ successfully offers a sustainable and novel approach to fight hair loss. In a clinical study involving AnaGainâ„¢ it was shown that the anagen : telogen coefficient (proportion of active hair follicles to degenerating ones) could be improved from 4 to 7.2 corresponding to a 78% increase in hair growth in just 3 months. 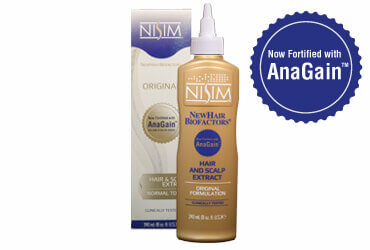 AnaGainâ„¢ is thus a natural and sustainable contributor to fuller and thicker hair. How often do I need to use the extract? We suggest that you apply the extract at least twice daily. Ensure that the application has fully been absorbed into the scalp. It will look as if it has dried off and then you will be able to apply the extract a second time. If the extract works will it be more effective if I use it more often. No, the extract is similar to a multivitamin as your body will only absorb as much as is needed. Two to three applications will provide you with the best coverage for intended results. Will I need to use the extract for life? No, once you have desired results you can discontinue usage. What is different from the Gel Formula? The original formula is more effective for use on oily hair and scalps. Both formulas will function as expected if used on normal to oily or normal to dry hair and scalps. Is this part of a hair treatment or hair care program? While we have no established hair treatment program to follow, using either of the extract formulas with the NewHair Biofactors shampoo and conditioner will ensure best results. Where can I find the Gel Formula?